To have this shoe custom moulded to your feet visit there store. They will not custom fit shoes purchased online. These are Shimano’s top of the range, none-higher, all-singing and quite a bit of dancing, race shoes. A cursory glance would tell you they had a full length carbon sole, the bare minimum in tread, two cut-to-your-desired-length Velcro straps and a micro adjust ratchet. And that they were really quite silver. What you would also see is that they say ‘custom fit’ on the side. 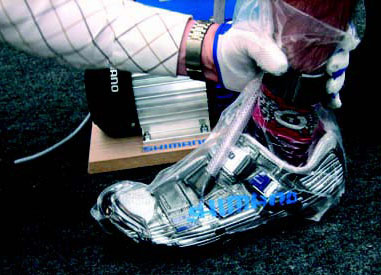 Custom fit shoes aren’t a new idea, we’ve been putting wedges in our shoes for ages, but Shimano has a slightly different take on it in that the shoe is mouldable to your feet. This means that even the most odd shaped feet can be hugged and supported in all the right places. The process of being fitted for these is almost worth the asking price alone; First the insole is removed from the shoe, the shoe is heated in a special oven and the insole re-inserted into the shoe for you to put your feet into. Your foot and shoe are put into a plastic bag (bear with us…) and then a vacuum hose is inserted and all the air is sucked out of the bag. This forces the shoe to form-fit round your heel and mid foot. The insole is then heated up, reinserted and you stand in a pedaling stance to form the insole to your toe shapes. 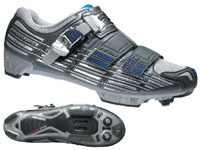 What you walk away with, in a nice Shimano bag, is a shoe that exactly matches your feet. And it feels wonderful.